Can Romania compete in attracting the foreign leisure traveler? A good place to start on the subject of ‘tourism’ is with the exceptional four volume Romanian Encyclopedia (Enciclopedia Romaniei) edited by the famed Professor D. Gusti and published in the late 1930s. Three things strike you when reading Volume IV on the national economy and 160 pages devoted to Tourism. The first is that ‘tourism’ had become during the 1930s a sophisticated undertaking with extensive leisure offerings throughout the country. The second is equally sophisticated commitment made to publicize these offerings to the wider world (meaning Europe and the United States at the time). And third, is the extensive list of international exhibits and expositions underwritten by the government as a means of popularizing awareness of Romania’s cultural identity and its economic vitality. Widely celebrated for their architecture and elegance, the most famous were in Brussels (1935), Paris (1937), London (1938), Berlin (1938), and New York (1939 –see photo) not to speak of numerous others in smaller cities. Why is foreign leisure tourism so anemic an industry in Romania – when it is booming worldwide? The answer can be found in part in the communist-era legacy of treating ‘tourism’ as a cheap mass market product. Mamaia hotels would be filled with bus loads of West European summer vacationers shunted into bland hotels by nationality: one for Swedes, one for Englishmen, etc. Quality was low, service was cursory, contacts with locals minimized, and the ‘bulk price’ was very cheap. In turn Romanian citizens were provided communist-styled vacation hotels, spas and clubs offering similarly low levels of comfort and amenities. That infrastructure endured mostly for worse through the 1990s, serving to ensure less and less foreign tourism interest as other countries such as Greece, Turkey, or Croatia offered increasingly superior amenities even at cheap rates. Another reason for the anemic numbers is a national budget that can little afford to rebuild the infrastructure and has insufficient promotional monies (whether well spent or misspent) to afford decent exhibition space or promotion. Aggrevating the situation is a competition between governmental ministries for authority over pieces of the ‘tourist’ pie. But most puzzling of all was a decision to place the ‘tourism’ responsibility within the Minister of Transport, Construction and Tourism. What can be done? Some suggestions. First is to understand that the principal magnet for a foreign visitor to Romania is its cultural heritage and natural beauty. Sibiu, designated European Cultural Capital for 2007 and potentially a UNESCO designated ‘Heritage City’ – is a perfect example as a Romanian location having the attractiveness and diversity needed to appeal to larger numbers of leisure tourists but it still lacks the lodgings and restaurants. [See: Sibiu commentary] The ‘heritage’ business is said to generate $200-400 billion dollars in West Europe alone. It is a dynamic growth industry. The easiest and most cost-effective method is to more effectively map and promote ‘scenic’ routes with well highlighted sites – that are also well marked with international standards signage. At the same time, an effort is needed to encourage the private sector to build an appealing infrastructure of high-comfort hotels/inns/restaurants that cover the nation. Twenty or thirty well distributed lodgings – of which at least 5-10 small high quality lodgings already exist – would allow a traveler to plan on predictable standards of high-quality hospitality throughout the country. While those that already exist are only recently built, the goal would be to create a network much like the Portuguese Posadas or French Relais or British Landmark Trust that appeal to well-paying foreign (or domestic) travelers drawn to Romania by its traditional culture and unique heritage. A corner needs to be turned, too, in making the country’s wildlife less a target for high-paying hunters than as a resource for eco-minded leisure travelers in the same fashion that has been encouraged in other countries. Killing of artificially cornered bears for $5000 to $10,000 is less productive than ensuring appropriate survival of the species and professionally managed exposure to them for the nature explorer. The latter generates more jobs through services providing lodgings, meals, and transport. Lastly, young graphic designers, web site creators, photographers, and others could be challenged to conceive promotional materials and content that is compelling and inviting. Content raw material already exists (photo files, film inventory, etc) and does not need to be recreated at high cost. This material could be creatively packaged for distribution internationally to libraries, schools, public places, conferences. The opportunity is there. Unmanaged it may morph into something undesirable in its lack of sensitivity to either heritage or landscape. Well managed it can turn an intangible but fragile cultural heritage into a vibrant economic asset. NOTE:0 The writer’s father served as Minister of Tourism and Propaganda for one year in 1938. Berlin – Romania will be represented by 35 tourism companies and specialised institutions at the largest tourism fair in the world, The International Fair in Berlin – ITB 2006, organised between March 8 and 12. The fair will be attended both by the National Authority for Tourism and the National Authority for Youth, the National Forests Regie, but also by ecotourism and tourism associations, representing the main areas of the country, as well as important tourism companies – Atlantic Tour, Marshal Tourism, ONT Carpati, Paralela 45, Ana Hotels, Transylvania Tour, Danubius, Nova Touring, Prestige Tours, Golden Tulip Bucuresti etc. This year, Romania will be present with a 400-sq m stand, inside the hall 11, close to the stands of Hungary, Czech R., Slovakia and Serbia. At the stand, the visitors, but also the representatives of the international tour-operators, will be able to be informed at the 35 specialised offices, they will be able to taste the Romanian wines, they will admire the popular art and they will be able to consult the offer of the Romanian tourism companies, which will be presented through flyers and images. Romania is represented by the president of the National Authority for Tourism (ANT), Ovidiu Iuliu Marian, and by the Mayor of Sibiu, Klaus Johannis, who will present the “Sibiu- 2007 Cultural European Capital” programme. The two will also attend on Thursday the press conference where they will present the offer of Romania on the specialised market. Also on Thursday, there will be organised a Romanian night, where Romanian food will be tasted, local wines and Romanian music will be played, the guests are both the Romanian companies but also exhibitors, as well as numerous officials, representatives of the German Parliament, the Federal Ministry of Economy and of the Tour Operators Association from Germany. A record number of 10,856 exhibitors and 142,000 visitors are expected at this year’s Fair, approx 4 per cent more than the number reported in 2004, in spite the fact that ITB is organised on the background of the bird flu spreading and of the preparation for the World Football Championship (which could be postponed because of this situation). The number of visitors will maintain at the same level registered in 2005, with approx 84,000 professional visitors, for whom the first three days of the Fair are exclusively dedicated, while the larger public is expected starting the third day of the Fair. Romanian exposition at the New York World’s Fair 1939. 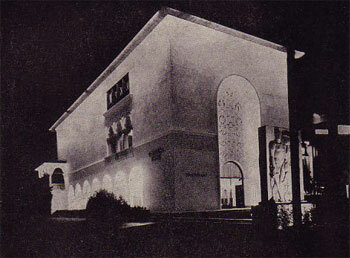 The large and elegant ‘Brancovan-Modernist’ building was the most popular foreign exhibit for the 44 million people who came to the Fair Grounds.